The Kingdom of Hanover in 1815. 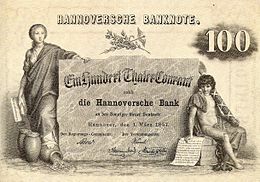 The Kingdom of Hanover (German: Königreich Hannover) was established in October 1814 by the Congress of Vienna, with the restoration of George III to his Hanoverian territories after the Napoleonic era. It succeeded the former Electorate of Brunswick-Lüneburg (known informally as the Electorate of Hanover), and joined 38 other sovereign states in the German Confederation in June 1815. The kingdom was ruled by the House of Hanover, a cadet branch of the House of Welf, in personal union with the United Kingdom of Great Britain and Ireland until 1837. Since its monarch resided in London, a viceroy (usually a younger member of the British Royal Family) handled the administration of the Kingdom of Hanover. The personal union with the United Kingdom ended in 1837 upon the accession of Queen Victoria because females could not inherit the Hanoverian throne, so her uncle became the ruler of Hanover. Hanover backed the losing side in the Austro-Prussian War and was conquered by Prussia in 1866, subsequently becoming a Prussian province. Along with the rest of Prussia, Hanover became part of the German Empire upon unification in January 1871. Briefly revived as the State of Hanover in 1946, the state was subsequently merged with some smaller states to form the current state of Lower Saxony in West Germany, later Germany. The territory of Hanover had earlier been a principality within the Holy Roman Empire before being elevated into an electorate in 1708, when Hanover was formed by union of the dynastic divisions of the Duchy of Brunswick-Lüneburg, excepting the Principality of Brunswick-Wolfenbüttel. After his accession in 1714, George Louis of the House of Hanover ascended the throne of Great Britain as George I, and Hanover was joined in a personal union with Great Britain. Descendants of Hanoverians who fought alongside the British in the War of 1812 remain in Canada. In 1803, Hanover was conquered by the French and Prussian armies in the Napoleonic Wars. The Treaties of Tilsit in 1807 joined it to territories from Prussia and created the Kingdom of Westphalia, ruled by Napoleon's youngest brother Jérôme Bonaparte. French control lasted until October 1813 when the territory was overrun by Russian Cossacks. The Battle of Leipzig shortly thereafter spelled the definitive end of the Napoleonic client states, and the electorate was restored to the House of Hanover. The terms of the Congress of Vienna in 1814 not only restored Hanover, but elevated it to an independent kingdom with its Prince-Elector, George III of Great Britain, as King of Hanover. 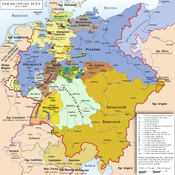 The new kingdom was also greatly expanded, becoming the fourth-largest state in the German Confederation (behind Prussia, Austria and Bavaria) and the second-largest in north Germany. Under George III's six-year reign, he never visited the Kingdom. Having succumbed to dementia prior to the elevation of Hanover, it is unlikely he ever understood that he had gained an additional kingship nor did he take any role in its governance. Functional administration of Hanover was usually handled by a viceroy, which during the later years of George III's reign and the reigns of kings George IV and William IV from 1816 to 1837, was Adolph Frederick, George III's youngest surviving son. When Queen Victoria succeeded to the British throne in 1837, the 123-year personal union of Great Britain and Hanover ended. Salic law operated in Hanover, excluding accession to the throne by a female while any male of the dynasty survived; thus instead of Victoria, her uncle in the male-line of the House of Hanover, Ernest Augustus, now the eldest surviving son of George III, succeeded to the throne of the new kingdom as King of Hanover; Adolph Frederick the younger brother, and long-time Viceroy, returned to Britain. During the Austro-Prussian War (1866), Hanover attempted to maintain a neutral position, along with some other member states of the German Confederation. Hanover's vote in favor of the mobilisation of Confederation troops against Prussia on 14 June 1866 prompted Prussia to declare war. 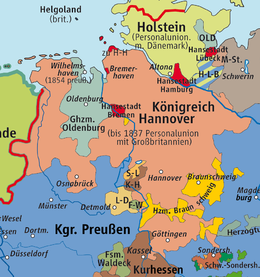 The outcome of the war led to the dissolution of Hanover as an independent kingdom and it was annexed by the Kingdom of Prussia, becoming the Prussian Province of Hanover. Along with the rest of Prussia, it became part of the German Empire in 1871. After George V fled Hanover in 1866, he raised forces loyal to him in the Netherlands, called the Guelphic Legion. They were eventually disbanded in 1870. Nevertheless, George refused to accept the Prussian takeover of his realm and claimed he was still the legitimate king of Hanover. His only son, Ernest Augustus, Crown Prince of Hanover, inherited this claim upon George's death in 1878. Ernest Augustus was also first in line to the throne of the Duchy of Brunswick, whose rulers had been a junior branch of the House of Hanover. In 1884, that branch became extinct with the death of William, a distant cousin of Ernest Augustus. However, since Ernest Augustus refused to renounce his claim to annexed Hanover, the Bundesrat of the German Empire ruled that he would disturb the peace of the empire if he ascended the throne of Brunswick. As a result, Brunswick was ruled by a regency until 1913, when his son, also named Ernest Augustus, married the German Emperor's daughter, Princess Viktoria Luise and swore allegiance to the German Empire. The Duke then renounced his claim to Brunswick in favor of his son, and the Bundesrat allowed the younger Ernest Augustus to take possession of Brunswick as a kind of dowry compensation for Hanover. The German-Hanoverian Party, which at times supported secession from the Reich, demanded a separate status for the province in the Reichstag. The party existed until banned by the Nazi government. Map of Kingdom of Hanover (until 1866), recreated in 1946 as the State of Hanover. With Prussia in agony and on the verge of official dissolution (1947), in 1946 Hanoverian politicians took advantage of the opportunity and advocated that the Control Commission for Germany - British Element (CCG/BE) revive Hanoverian statehood, reconstituting the Prussian Province of Hanover as the State of Hanover. The state saw itself in the tradition of the kingdom. Its Prime Minister, Hinrich Wilhelm Kopf, played a central role when the state of Lower Saxony was founded just a few months later by merging Hanover with several smaller states, with the city of Hanover as its capital. The former territory of Hanover makes up 85 percent of Lower Saxony's territory, and the state continues to use the old Hanover coat of arms. The Lutheran church was the state church of the Kingdom of Hanover with the King being summus episcopus [de] (Supreme Governor of the Lutheran Church). Regional consistories supervised church and clergy. These were in Aurich, a simultaneously Lutheran and Calvinist consistory dominated by Lutherans (for East Frisia) and the Lutheran consistories in Hanover (for the former Electorate of Brunswick-Lüneburg proper), in Ilfeld (for the County of Hohenstein, a Hanoverian exclave in the Eastern Harz mountains), in Osnabrück (for the former Prince-Bishopric of Osnabrück), in Otterndorf (existed 1535–1885 for the Land of Hadeln) as well as in Stade (existed 1650–1903, until 1885 for the former Bremen-Verden proper without Hadeln, then including the complete Stade region). A general superintendent chaired each consistory. In 1848, the Lutheran parishes were democratised by the introduction of presbyteries (German: Kirchenvorstände, singular Kirchenvorstand; literally: church boards), elected by all major male parishioners and chairing each congregation in co-operation with the pastor, being before the sole chairman. This introduction of presbyteries was somewhat revolutionary in the rather hierarchically structured Lutheran church. In 1864, Carl Lichtenberg, Hanoverian minister of education, cultural and religious affairs (1862–65), persuaded the Ständeversammlung (lit. Estates Assembly, the Hanoverian parliament) to pass a new law as to the constitution of the Lutheran church. The constitution provided a state synod (parishioners' parliament, German: Landessynode). But its first session only materialised in 1869 when, after the 1866 Prussian annexation of the Kingdom of Hanover, the Hanoverian Lutherans desired a representative body separate from Prussian rule, though it was restricted to Lutheran matters only. After the Prussian conquest in 1866, on 19 September 1866, the day before the official Prussian annexation took place and with the last summus episcopus, King George V of Hanover, in exile, the Kingdom's six consistories joined to form today's still-existing church body (Lutheran State Church of Hanover). An all-Hanoverian consistory, the Landeskonsistorium (state consistory), was formed with representatives from the regional consistories. While the Calvinist congregations in formerly-Prussian East Frisia had a common roof organisation with the Lutherans there ("Coetus") and the Reformed Church in the former County of Bentheim, then being the state church, had fully established church bodies for Bentheim only (German: Königlich-Großbrittanisch-Hannoverscher Ober-Kirchenrath, English: Royal British-Hanoverian Supreme Church Council), the Calvinist congregations elsewhere in Hanover were in a somewhat sorry state. Though some Calvinist congregations of Huguenot origin were organised in the Lower Saxon Confederation (German: Niedersächsische Konföderation). The Lutheran church being the state church of Hanover also supervised the Calvinist diaspora parishes outside East Frisia and Bentheim. In 1848 the new Hanoverian law also provided for presbyteries in these Calvinist parishes, which exactly fit the presbyterian structure of Calvinism. Catholics formed an overall minority in Hanover, but regionally majorities in the former prince-bishoprics. By the annexations in 1803 and 1814 Hanover had become a state of three Christian denominations. In 1824 Hanover and the Holy See thus agreed to integrate diaspora parishes which were located in prevailingly Protestant areas, until then supervised by the Roman Catholic Vicariate Apostolic of the Nordic Missions, into the existing dioceses of the former prince-bishoprics, whose diocesan territories were thus extended into the diaspora areas. Jews lived all over Hanover in diaspora. Until 1806, they were not allowed to reside in some areas. By the Westphalian and French annexations in 1807 and 1810 all male inhabitants in later restituted Hanover became Westphalian or French citizens of equal rights, though on 17 March 1808 Napoléon Bonaparte restricted the rights of Jews in the French-annexed territory by his so-called décret infâme. The Jewish congregations became subject to French regional Jewish consistories or the Royal Westphalian Consistory of the Israelites [he], respectively. When Hanover resumed independence and sovereignty in 1813 its government deprived the Jews their legal equality. Arguing it was the French or Westphalian state and not Hanover, which had emancipated the Jews, the government took the decisions of the German Confederation on the rights of the Jews, in Johann Smidt's manipulated formulation, as the legal grounds. In 1842, Hanover finally granted equal rights to Jews and promoted to build up Jewish congregations, where this did not already happen earlier, and a superstructure of four regional land-rabbinates. These were the Emden Land-Rabbinate (ambit: Aurich and Osnabrück regions), the Hanover Land-Rabbinate [de] (ambit: Hanover and Lüneburg regions), the Hildesheim Land-Rabbinate (ambit: Hildesheim region and Clausthal Mountain Captaincy), and the Stade Land-Rabbinate [nds] (ambit: Stade region). In many diaspora areas Jews regarded this a progress and a burden alike, because of the implied financial burden for rabbis and religion teacher, synagogues or schools. The local authorities now requested that the Jewish congregations establish synagogues and Jewish education for the pupils. The land-rabbins, chairing the land-rabbinates, simultaneously fulfilled religious and state functions, like supervising Jewish elementary schools and the teaching of Jewish religion in all schools. The Kingdom of Hanover was thus one of the few states within the German Confederation, where rabbins held a similar semi-state authoritative position as to Jews as did, e.g., Lutheran clergy towards Lutherans. In 1813, George III was restored to his Hanoverian territories, and in October 1814 they were constituted as the independent Kingdom of Hanover at the Congress of Vienna. The personal union with the United Kingdom ended in 1837 on the accession of Queen Victoria because the succession laws in Hanover, based on Salic law, prevented a female inheriting the title if there was any surviving male heir (in the United Kingdom, a male took precedence only over his own sisters). In the Austro-Prussian War of 1866, Hanover was annexed by Prussia and became the Province of Hanover. (aged 81) 12 October 1814 29 January 1820 Previously Prince Elector of Hanover from 1760 to 1806. George III was mentally incapacitated during these years, and his constitutional powers were exercised by his eldest son, George Augustus Frederick (the future George IV), as Regent. In Hanover, his youngest son, Prince Adolphus, Duke of Cambridge, officiated as Viceroy from 1816. (aged 67) 29 January 1820 26 June 1830 Son of George III. Prince Regent 1811–1820, represented in Hanover by his brother, the Duke of Cambridge, as Viceroy. (aged 71) 26 June 1830 20 June 1837 Son of George III • Younger brother of George IV. Last monarch to rule both Hanover and the United Kingdom, represented in Hanover by his brother, the Duke of Cambridge, as Viceroy. (aged 80) 20 June 1837 18 November 1851 Son of George III • Younger brother of George IV and William IV. The accession of Queen Victoria separated the crowns of the United Kingdom and Hanover, and the latter passed to her uncle. (aged 59) 18 November 1851 20 September 1866 Son of Ernest Augustus. Hanover was annexed by Prussia in the aftermath of the Austro-Prussian War. The Congress of Vienna instituted a territorial adjustment between Hanover and Prussia to form more contiguous borders. Hanover increased its area substantially, gaining the Prince-Bishopric of Hildesheim, East Frisia, the Lower County of Lingen and the northern part of the Prince-Bishopric of Münster. Hanover also annexed territories that had previously been ruled in personal union by its Elector, such as the Duchies of Bremen-Verden and the County of Bentheim. It lost those parts of Saxe-Lauenburg to the northeast of the Elbe, which was assigned in personal union to Denmark, except the Amt Neuhaus. Further small exclaves in the east were lost. Hanover thus comprised a number of territories, which had been Imperial Estates within the Holy Roman Empire. Their respective governments, now called provincial governments, were organised according to partially very old traditions, including different levels of estate participation in rule. In 1823, the kingdom was reorganised into high-bailiwicks (German: Landdrosteien, singular: Landdrostei), each led by a high-bailiff (German: Landdrost) according to unitary standards, thus doing away with the inherited provincial peculiarities. The Hanoverian subdivisions into high-bailiwicks and bailiwicks remained unchanged until 1 April 1885, when they were replaced by Prussian-style provinces (Regierungsbezirke) and districts (Kreise). The Kingdom of Hanover maintained an army after the Napoleonic Wars. In 1832, King William IV of Hanover issued his troops with British Army uniforms, but they differed slightly from their original British versions. When the personal union with the United Kingdom ended in 1837 and Ernst August ascended to the crown of Hanover, he replaced their uniforms with Prussian Army-style ones, which included the pickelhaube spiked helmet for his Guard Corps. By 1866 they wore a more Austrian style of uniform, with only the guard corps keeping the Prussian one. During the Austro-Prussian War, the Hanoverian Army fought and defeated the Prussians during its march south towards Austria, at the Battle of Langensalza. However it was later surrounded and forced to surrender to Prussia. After the personal union with Great Britain ended in 1837, Hanover kept the British royal arms and standard, only introducing a new Crown (after the British model). ^ But only in 1882 — long after the Prussian annexation of Hanover — the inappropriate supervision by Lutheran consistorials ended, when the Evangelical Reformed Church of the Province of Hanover emerged, comprising all the Calvinist congregations in the prevailingly Lutheran Province of Hanover. The simultaneously Lutheran and Calvinist consistory in Aurich was made the consistory of that church body, becoming an exclusively Calvinist body only in 1922, following the constitutional reorganisation of the church bodies after the Weimar Constitution had decreed the separation of church and state in 1919. ^ In the final revision of the decisions of the Congress of Vienna on the rights of the Jews, Smidt — unauthorised and unconsented by the other parties — had changed the text from "The confessors of Jewish faith are preserved the rights already conceded to them "in" the confederal states", by replacing a single word, which ensued serious consequences, into: "The confessors of Jewish faith are preserved the rights already conceded to them "by" the confederal states." cf. Heinrich Graetz, Geschichte der Juden von den ältesten Zeiten bis auf die Gegenwart: 11 vols., Leipzig: Leiner, 1900, vol. 11: 'Geschichte der Juden vom Beginn der Mendelssohnschen Zeit (1750) bis in die neueste Zeit (1848)', p. 317. Emphasis not in the original. Reprint of the edition last time revised by the author himself: Berlin: arani, 1998, ISBN 3-7605-8673-2. In the German original: "Es werden den Bekennern des jüdischen Glaubens die denselben "in" ["von", respectively] den einzelnen Bundesstaaten bereits eingeräumten Rechte erhalten." ^ Jörg Schneider, Die jüdische Gemeinde in Hildesheim: 1871—1942, Hildesheim: Stadtarchiv, 2003, (=Schriftenreihe des Stadtarchivs und der Stadtbibliothek Hildesheim / Stadtarchiv und Stadtbibliothek Hildesheim; vol. 31), p. 3; simultaneously: Göttingen, Univ., Diss., 1999. ISBN 3-931987-11-6. ^ After the Prussian annexation the constitution of Hanover's four land-rabbinates came under threat to be abolished, because in Prussia proper the government hindered as much as possible the establishment of nationwide Jewish organisations, let alone such which it would grant official recognition. In the end, Prussia respected the existing Hanoverian land-rabbinate constitution, which continued to exist — modified according to the separation of state and religion in 1919 by the Weimar constitution — until the Nazi Reich's government de facto abolished the constitution in 1938. ^ König, Lutz (1999). Kingdom of Hanover - German Civil War 1866. Retrieved 3 April 2017. ^ a b Colton, J. H. "National Flags". J. H. Colton. Retrieved 18 May 2014. ^ a b Johnson, Alvin Jewett. "Johnson's New Chart of National Emblems". Alvin Jewett Johnson. Retrieved 18 May 2014. Ernest Augustus was the reigning Duke of Brunswick from 2 November 1913 to 8 November 1918. He was a grandson of George V of Hanover, whom the Prussians had deposed from the Hanoverian throne in 1866, and Christian IX of Denmark. The King of Hanover was the official title of the head of state and hereditary ruler of the Kingdom of Hanover, beginning with the proclamation of the King of the United Kingdom George III, as "King of Hanover" during the Congress of Vienna, on 12 October 1814 at Vienna, and ending with the kingdom's annexation by Prussia on 20 September 1866. The Diocese of Osnabrück is a diocese of the Catholic church in Germany; which was founded around 800. It should not be confused with the smaller Prince-Bishopric of Osnabrück – an ecclesiastical principality of the Holy Roman Empire until 1803 – over which the bishop, as prince-bishop, exercised both temporal and spiritual authority. William, Duke of Brunswick, was ruling duke of the Duchy of Brunswick from 1830 until his death. The Battle of Langensalza was fought on 27 June 1866 near Bad Langensalza in what is now modern Germany, between the Kingdom of Hanover (Hanoverians) and the Prussians. The Hanoverians won the battle but were then surrounded by a larger and reinforced Prussian army, and, unable to link up with their Bavarian allies to the south, they surrendered. This marked the demise of the Hanoverian Army and the annexation of Hanover into the burgeoning kingdom of Prussia as it systematically unified Germany into the modern nation state. The Duchy of Brunswick State Railway was the first state railway in Germany. The first section of its Brunswick–Bad Harzburg railway line between Brunswick and Wolfenbüttel opened on 1 December 1838.